For the qualitative detection of Malaria Pf/Pan antigen in whole blood. 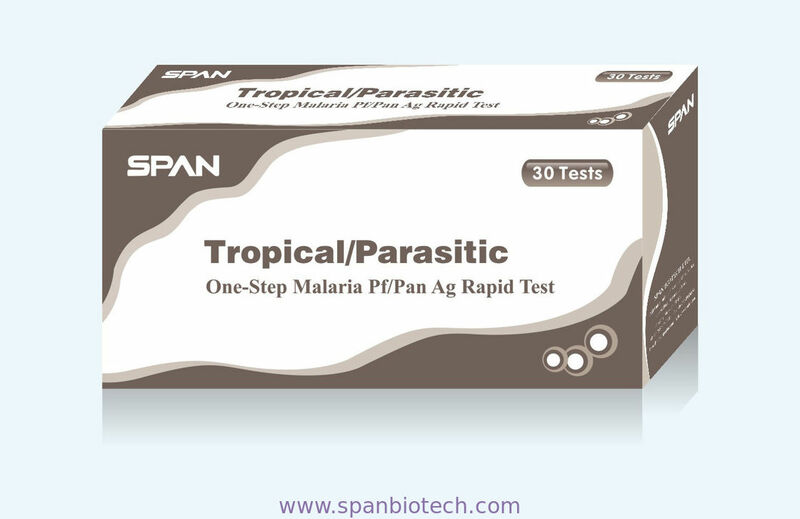 The Malaria Rapid Test is a lateral flow chromatographic immunoassay for the simultaneous detection and differentiation of Plasmodium falciparum (Pf) antigen and P. vivax, P. ovale, or P. Malariea antigen in whole blood. This device is intended to be used as a screening test and as an aid in the diagnosis of infection with Plasmodium. Any reactive specimen with the Malaria Rapid Test must be confirmed with alternative testing method(s) and clinical findings. Malaria is a mosquito-borne, hemolytic, febrile illness that infects over 200 million people and kills more than 1 million people per year. It is caused by four species of Plasmodium: P. falciparum, P. vivax, P.ovale, and P. malariae. These plasmodia all infect and destroy human erythrocytes, producing chills, fever, anemia, and splenomegaly. P. falciparum causes more sever disease than the other plasmodial species and accounts for most malaria deaths. P. falciparum and P. vivax are the most common pathogens, however, there is considerable geographic variation in species distribution1. Traditionally, malaria is diagnosed by the demonstration of the organisms on Giemsa stained smears of peripheral blood, and the different species of plasmodium are distinguished by their appearance in infected erythrocytes1. The technique is capable of accurate and reliable diagnosis, but only when performed by skilled microscopists using defined protocols2, which presents major obstacles for the remote and poor areas of the world. The Malaria Rapid Test is developed for solving these above obstacles. It detects the antibodies generated in serum or plasma in response to the infection of plasmodium. Utilizing the Pf. 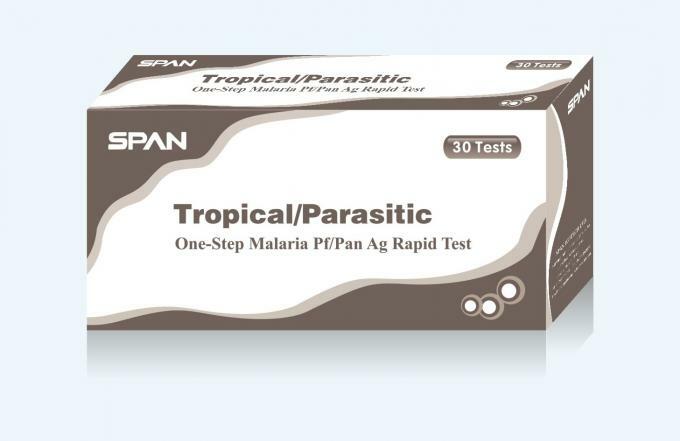 specific antigen (HRP-II) and pan-malaria antigen (aldolase), the test enables simultaneous detection and differentiation of the infection of P.falciparum and or P. vivax, ovale, and malariae3-5, by untrained or minimally skilled personnel, without laboratory equipment. The Malaria Rapid Test is a lateral flow chromatographic immunoassay. The test cassette consists of: 1) a burgundy colored conjugate pad containing mouse anti-pHRP-II antibody conjugated with colloid gold (pHRP II-gold conjugates) and mouse anti-pLDH antibody conjugated with colloid gold (pLDH-gold conjugates), 2) a nitrocellulose membrane strip containing two test bands (T1 and T2 bands) and a control band (C band). The T1 band is pre-coated with monoclonal anti-pLDH antibody by which the infection with any of the four species of plasmodia can be detected, the T2 band is pre-coated with polyclonal anti-pHRP-II antibodies for the detection of Pf infection, and the C band is coated with goat, anti-mouse IgG. During the assay, an adequate volume of the blood specimen is dispensed into the sample well (S) of the test cassette, a lysis buffer is added to the buffer well (B). The buffer contains a detergent that lyses the red blood cells and releases various plasmodium antigens, which migrate by capillary action across the strip held in the cassette. pHRP-II if presents in the specimen will bind to the pHRP II-gold conjugates. The immunocomplex is then captured on the membrane by the pre-coated anti-pHRP-II antibodies, forming a burgundy colored T2 band, indicating a Pf positive test result. pLDH if presents in the specimen will bind to the pLDH gold conjugates. The immunocomplex is then captured on the membrane by the pre-coated anti pLDH antibody, forming a burgundy colored T1 band, indicating a plasmodium positive test result. In the absence of T2 band, a positive test result for any of the other three plasmodia can be recommended. Absence of any T bands(T1 and T2) suggests a negative result. The test contains an internal control (C band) which should exhibit a burgundy colored band of the immunocomplex of goat anti-mouse IgG/mouse IgG (pHRP-II and pLDH-gold conjugates) regardless of the color development on any of the T bands. Otherwise, the test result is invalid and the specimen must be retested with another device.